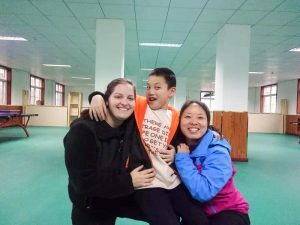 Our therapy team visited Samuel (Dang Liming) at his orphanage in Changzhi, Shanxi province. During the two-day visit, our team was able to tour the welfare home, provide training for the teachers and deliver toys to Samuel, as well as a weighted therapy blanket. There is currently no therapy being done at this facility, but they have a small school consisting of four teachers and eighteen children of varying needs and abilities. Samuel participates in the activities of this school. While we were there, our team was able to instruct the teachers on how to perform developmental assessments in order to better divide the classes into more functional units. This training was very well received and has been kept up since our visit. We saw that Samuel continues to use the signs he learned in American Sign Language as an additional means of communication. We were thrilled to see that he remembers all the signs to the song “Twinkle, Twinkle, Little Star,” which he learned while living at SFCV! Samuel is doing very well and has made many new friends. He greatly enjoys singing, dancing, playing on the playground and helping care for the toddlers in the school. Our Therapy team is planning to make a return visit to Changzhi this spring.